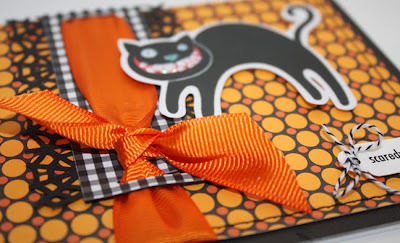 The supplies include: Card- DCWV; Patterned paper- (orange) Papertrey Ink, (black&white) Making Memories; Punch- Martha Stewart; Stickers- (cat) MAMBI, (tag) Making Memories; Twine- Martha Stewart. 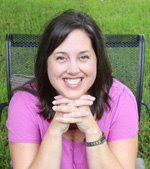 Next, is my submission for the current challenge at the CPS blog, challenge 130. Be sure to check that one out....the prize is from Jillibean Soup!! We found these fun dimensional stickers from "atd" at Hobby Lobby....I also paired it with an American Crafts journal sticker, Martha Stewart's new loopy punch and ribbon from my stash. The card base (white) is also from DCWV. I love their textured card stacks. The polka dot paper was a leftover sitting on my desk from MAMBI. And... 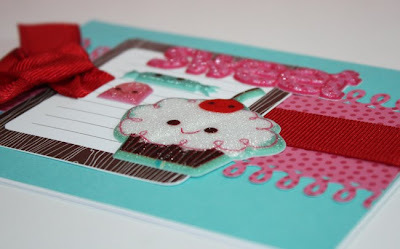 I also used my ribbon punch tool from Making Memories on both cards, love that thing! your cards are perfectly FABULOUS!!! love, love, LOVE them both!! that cat makes me smile! Super cute! Thanks for playing at 2S4Y! 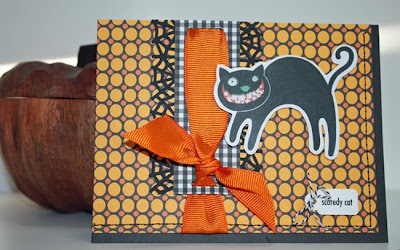 Oh my goodness, both your cards are super cute....but I just LOVE that Halloween card! Your choice of PP is awesome, and I love the cat with the sentiment. Great job! Really cute cards! The cupcake looks good enough to eat! What really cute creations - LOVE how you used the CPS sketch. Hmmm, I don't know which is my favorite. 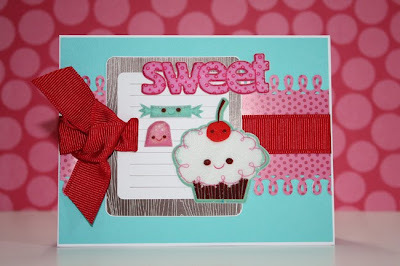 I love fall, but have a super soft spot for cupcakes! Great work on both of them! !